Portillo Ridge is an active adult community in Green Valley, Arizona. 55+ homebuyers are flocking to Southern Arizona for its year-round warm climate, plenty of amenities, and social opportunities. Residents pay Green Valley Recreation (GVR) fees, this provides them with access to the 13 recreation centers spread throughout Green Valley. Not only do Portillo Ridge s homeowners enjoy dozens of clubs and activities hosted by GVR, but the community also hosts events where getting to know neighbors is a breeze. Green Valley Recreation (GVR) memberships are available to Portillo Ridge s homeowners. The fees provide them with access to multiple recreation centers that are equipped with a great lineup of indoor and outdoor amenities. GVR s amenities include five fitness centers, 24 meeting rooms, 13 swimming pools, parks, hobby studios, and plenty of sports courts. Residents of Portillo Ridge take advantage of the Southern Arizona climate by accessing fishing lakes and miles of walking trails. There are 143 single-family homes that encompass Portillo Ridge. These Santa Fe-style homes feature low-maintenance stucco exteriors and main-level living. Active adult homebuyers can select a resale home that ranges from approximately 1,633 to 2,227 square feet in size. Most homes include two to four bedrooms, two to three bathrooms, and an attached garage. Many of the residences were built as semi-custom homes built on quarter to half-acre lots with most having or adjacent to natural desert. The Green Valley area is mostly made up of 55+ retirement communities. Residents of Portillo Ridge enjoy living in a place where they share the same interests and pastimes with neighbors. GVR hosts a plethora of activities, classes, and events throughout the year. There are numerous clubs, cards and games, drop-in activities, social clubs, and sports groups. Within the neighborhood of Portillo Ridge, a social committee hosts events like potluck dinners, pizza and holiday parties. Portillo Ridge is located in Green Valley, Arizona. 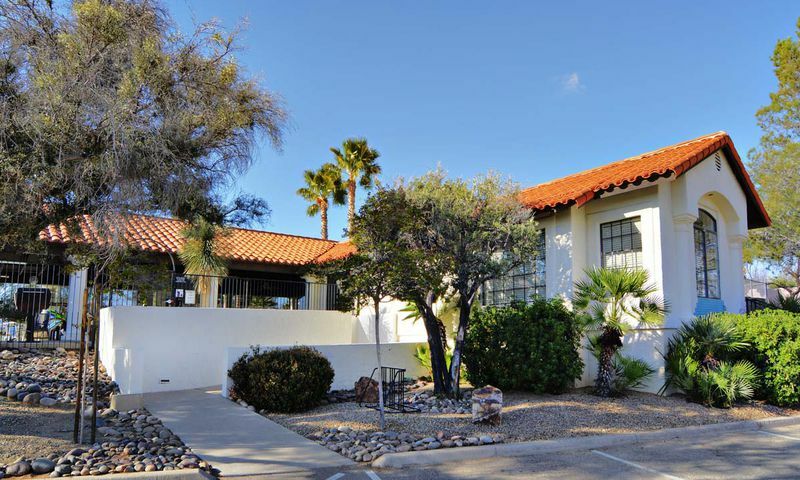 Green Valley is a conglomerate of 55+ active adult communities just south of Tucson. Situated near the Santa Rita Mountains, Portillo Ridge s homes have a spectacular backdrop as well as plenty of outdoor recreation. 21 healthcare facilities service the Green Valley area. Within a 30-mile radius you will find The University of Arizona Medical Center, Carondelet St. Mary s Hospital, Tucson Medical Center, Carondelet St Joseph s Hospital, and Oro Valley Hospital. Currently a $63 million, 146,000 square-foot hospital is being built in Green Valley. Residents of Portillo Ridge can rest assured knowing they are within a close distance to plenty of amenities, activities, and necessities. There are plenty of activities available in Portillo Ridge. Here is a sample of some of the clubs, activities and classes offered here. Active adult homebuyers can select a resale home that fits their needs. Portillo Ridge is made up of 143 single-family homes. Generally, most residences offer between 1,633 and 2,227 square feet of living space. These low-maintenance homes include two to four bedrooms, two to three bathrooms, and attached garages. Please Note: Floor plans are unavailable at this time. If you want a great lifestyle you can't go wrong buying in any of the Green Valley communities. Portillo Ridge is nice because a lot of the homes here are semi-custom and are just a little more unique than others we saw. We liked the curb appeal and the architecture too. Every clubhouse we've been to has been nice, although we haven't had a chance to visit them all yet. 55places.com is not affiliated with the developer(s) or homeowners association of Portillo Ridge. The information you submit is distributed to a 55places.com Partner Agent, who is a licensed real estate agent. The information regarding Portillo Ridge has not been verified or approved by the developer or homeowners association. Please verify all information prior to purchasing. 55places.com is not responsible for any errors regarding the information displayed on this website.